Join me at the movies with Jane and Liz and Cathy, as we discuss three classic works of romance and their various movie and TV adaptations. Whether you are in the mood for serious academic discussion or lighthearted snark, whether you prefer Regency romance or Gothic passion, and whether you prefer your love stories on the screen or on the page, this book has something for you! Gave a 5-star review of this book at B&N online which inexplicably made my comments anonymous. Here, owning the opinion, is what I said about Carrie’s wonderful book, at last the definitive guide (bonus, funny too! 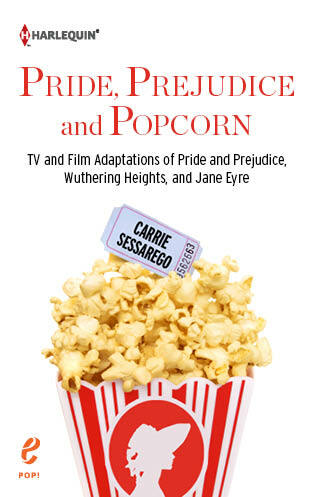 ): ” Yes, if you love (even if you don’t) Jane Austen, Emily Bronte and Charlotte Bronte, and their famous novels, you’ll enjoy the humor and pathos of Carrie Sessarego’s guide to the work of these groundbreaking women across the media offerings from their time to ours. Each book featured — Pride and Prejudice, Jane Eyre and Wuthering Heights — is covered not only as book but also big picture, adaptations and final scorecard. As an example of the synthesis of comparisons and contrasts, the guide book notes that they all lived happily ever after (unless they were in Wuthering Heights). You’ll live more happily after reading this book! Thank you so much, Jan! So thrilled that you enjoyed the book! Giving an author a review (whether negative or positive) on B&N, Amazon, etc is such a great gift to an author. Thank you!